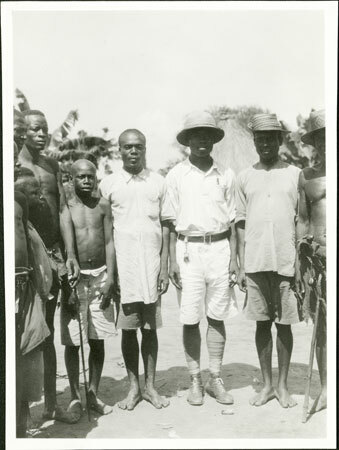 A group of men, identified as some Chief's sons - Reuben wiri Rikita (in pith helmet); Renzi (to right with upturned hat brim), wiri Gangura (i.e. son of Gangura, to left in white shirt - [see 1998.341.32], wiri Rikita (i.e. a son of Rikita, probably to left in white shorts). Morton, Chris. "Group of Zande men" Southern Sudan Project (in development). 03 Jan. 2006. Pitt Rivers Museum. <http://southernsudan.prm.ox.ac.uk/details/1998.341.74.2/>.